of Courtyard Peacock remain available. I just adore peacocks, and I wanted to come up with a design that represented one beautifully and also included a lot of movement. I think the unusually colored pressed glass leaves and Swarovski Tanzanite Dorado bicones with the gold flash work perfectly as representations of the peacock's feathers, I really love the realization of this particular design idea! Zircon and deep sapphire blue Bohemian pressed glass leaves and Swarovski Tanzanite Dorado bicone crystals dangle at the end of this one-of-a-kind LongLocks kanzashi hair pin, from gold plated peacock-adorned filigree. 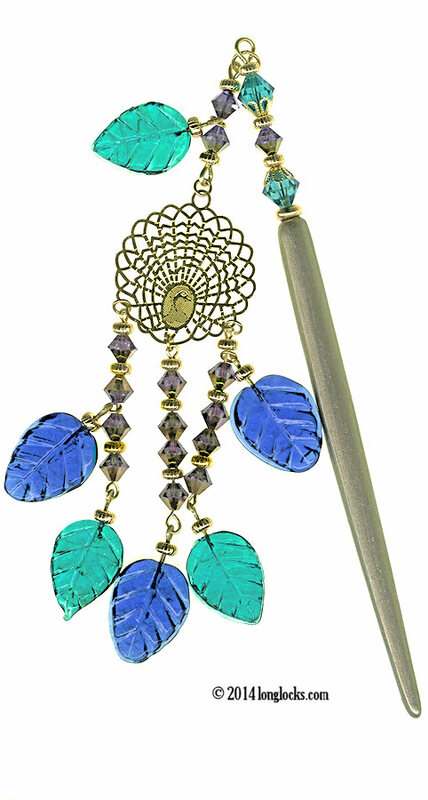 Two Swarovski Blue Zircon bicone crystals nestled into gold plated flower bead caps, and a Swarovski Tanzanite Dorado bicone crystal, adorn the end of the hair stick. Gold plated heishi beads complete the hair jewelry design. The hair stick is carved bone, hand painted in shimmering gold under layers of protective clear enamel. The archived Courtyard Peacock GeishaStix hair pin measures approximately 5 3/4" long from end to end (excluding dangle). The dangle measures 5" in length.